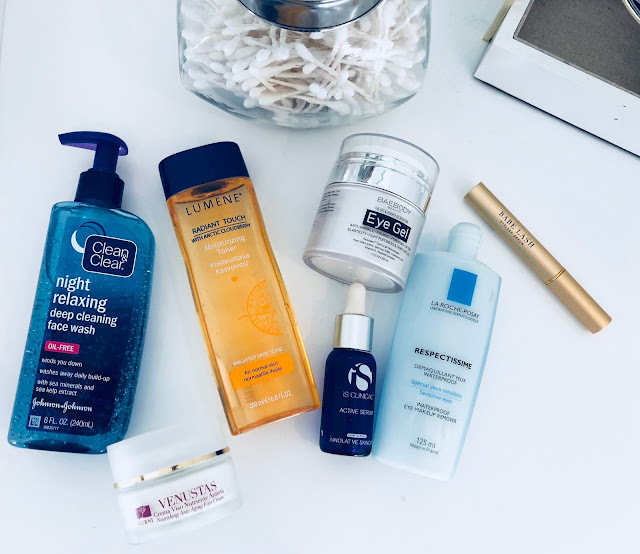 Sharing with you today my nightly skincare routine. I used to only wash with soap and water and call it a night, but over the last few years my skin has definitely started to need more. For reference, I have combination skin, which can get oily on my forehead, nose, and chin but is otherwise pretty dry. It took me a while to build up to and figure out what products worked best for me, and to even learn the appropriate order of what to use when, but here goes: my favorites and how I use them. 1. Cleanser. I never use waterproof products, and yet I still have a hard time finding a cleanser to remove all of my makeup. My absolute favorites are Shiseido Ibuki Gentle Cleanser (a bit of a splurge but works SO well) or Neutrogena One Step Gentle Facial Cleanser And Makeup Remover (but has been out of stock on Amazon and I can’t seem to find it anywhere else, either). So, this month, I’m rolling with a Clean and Clear product because it was the easiest to reach for and run with two kids in the shopping cart. I must say, I’m pretty impressed. It does a decent job and doesn’t dry out my skin, and doesn’t include microbeads, those tiny plastic environmental disasters. 2. Eye makeup remover. I added in this step about 6 months ago along with its Toner companion, below. This La Roche-Posay product is the best I’ve tried and wipes away completely any remaining traces of makeup and leaves my eyes clean and bright. 3. Toner. An important step to wipe away any remaining impurities and to restore your skin’s pH balance. I really love the Lumene Moisturizing toner, which I can’t find to link for you anywhere at the moment (sorry!) but anything alcohol free with rosewater or chamomile are your best bets. This Thayers toner is the Amazon best-seller with extremely good reviews. 4. Serum. A face serum is a lightweight product made up of smaller molecules that can penetrate deeply into the skin and deliver a very high concentration of active ingredients. This makes them a great tool for targeting specific skincare concerns, like wrinkles. I got sent the iS Clinical Active Serum to try and it has truly worked wonders on my skin. I totally understand the sticker shock, however, and will probably revert back to my trusty Lumene Serum once this bottle is done. A little goes a LONG way here, so just a drop or two from the dropper can be applied to your face to check this box. 5. Night Cream. Yes, this is different from your daily moisturizer. Night creams slowly absorb into the skin overtime and are super hydrating. I really love Abeauty’s product and Baebody’s product and rotate back and forth. I massage it in all over my face, including my neck, and let it absorb for a minute or two before moving on. 6. Eye Cream This one has been the biggest difference maker. I went based on reviews, and they didn’t steer me wrong. This product has reduced my dark circles and tightened up my skin and fine lines. Overall, I just look more AWAKE. I massage into my eyelids, under eyes, and all the way out to my temples. 7. Babe Lash. Have to include this one here because I’ve been so consistent with it and seen such amazing results. My first concern was whether it could cause eye discoloration, because I have light blue eyes. I confirmed with my ophthalmologist (by actually bringing the tube to her) that Babe Lash does not contain the ingredient that could potentially discolor eyes, like Latisse. She gave me the reassurance to use it. I apply Babe Lash nightly before bed, with one swipe right at my eyelash line. Around 4 weeks, I began to notice a definite difference in length, especially with mascara. Now, 7+ months out, with mascara, my eyelashes touch my eyebrows. I use it a few times a week to maintain the length that I now have. For reference, one 4mL tube lasted me about 5 months. And there you have it. Consistency is key, here, but this little routine has completely changed my skin and only takes me 5 minutes or so before bed. It also evens out my skin tone and keeps my skin smooth, which makes your makeup apply and look even better. Happy to answer any questions if you have them, so send them my way! And let me know any of YOUR skincare favorites. I’m always up for trying out something new!